While there are some basic and essential manners each horse should have while being handled, there are also a few that should be expected when under saddle. One of these '"good manners" is standing still while the rider mounts. Many horses squirm, fuss, and sidle away when the rider attempts to get into the saddle. And even if they do stand for mounting, they move off immediately before the rider has time to settle into the saddle and organize the reins. Some horses back up rather than move forward. The consequences of allowing this bad habit to continue range from annoying and inconvenient to dangerous, especially if the horse bolts away before the rider is secure. There are a few reasons why this happens, and as with most "horse problems", it's important to ask why before attempting to solve the problem. This will prevent you from making your horse more frustrated or uncomfortable and shorten the length of time you'll need to break this habit. Many problems under saddle can be caused by a sore back. The reasons for a sore back can be numerous—from skin lesions to sore feet to dental problems, and it sometimes takes careful troubleshooting to find the source. It may not be obvious, but something like hoof or leg problems can make a horse travel differently, tensing muscles that can become sore and tired over time. An unfit horse may suffer temporary back pain until they are conditioned for their work. Poorly fitting saddles can cause back soreness—either just while your mounting or the whole time you're riding. Sometimes horses need chiropractic adjustments that can alleviate back pain. Muscle strain that occurs while working or playing can cause back pain. Test for back pain by exploring your horse's back with your fingertips, penetrating the muscles on both sides of the spine with your fingertips. Treat any skin conditions and wait until they're healed before starting to ride again. Sore muscles are stiff and sore. If the horse has been sore for a long time, it may even 'block out' the pain and make the pain harder to discover. Your vet, an equine massage therapist, or a chiropractor can help you diagnose back pain. Pads and blankets can cause problems if they've become dirty and lumpy, have burrs or grass haws embedded in them, or are pulled down tightly across the horse's withers. Make sure your pads or blankets are smooth and clean. Pull the pad or blanket up off of the horse's withers after you put the saddle on so it's not digging into the horse at the withers. This is common with young horses and will resolve itself as the horse learns to balance a rider and gains fitness and coordination. Any horse can be pulled off balance and squirm around to rebalance itself if the rider is awkward and heavy as they climb into the saddle. Learn to lift yourself into the saddle and perhaps use a mounting block to make the job easier for you and the horse. It's important to settle yourself gently into the saddle and not just flop down. Your horse may squirm in anticipation and emit an equine "oof" as you plunk into the saddle. Use a mounting block and lower yourself gently into the saddle once you're up there. If the rider isn't careful about putting their foot in the stirrup with the toe pointing either frontwards or backward, they may dig their toe into the horse's ribs on the way up. The horse may take this as a cue to move forward. Use a mounting block to make getting on easier. Be sure you're not using your reins to anchor yourself as you mount. You should have contact on the horse's mouth, but the reins need to be loose enough that they’re not cueing the horse to back up. It's not unusual for horses to anticipate the work they have ahead of them and protest by making it difficult for the rider to mount. If all other reasons have been ruled out, a little retraining will be required. 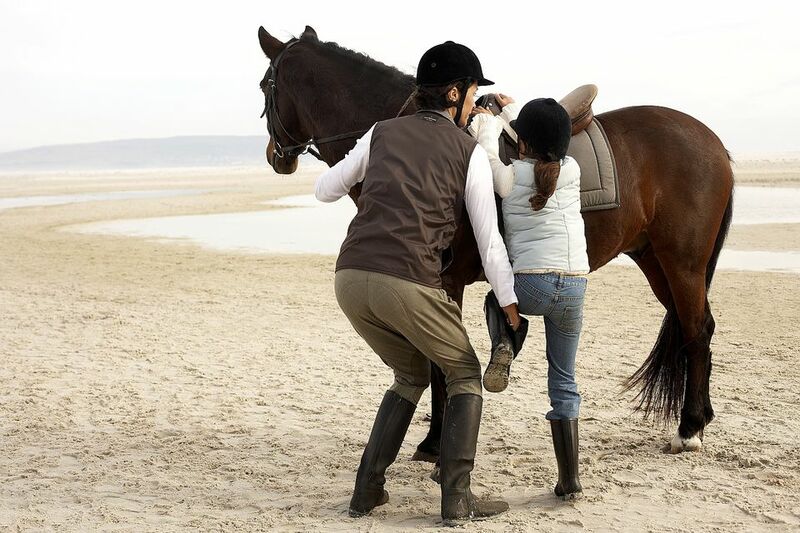 An assistant can be helpful to prevent the horse from backing up or swinging out. The horse should stand quietly when in hand. If the horse moves forward, be ready to ask it to halt. The horse shouldn't circle around you. Another person can be helpful to ask the horse to stand quietly from the ground. Make the horse stand still as you put your toe in the stirrup. Once the horse stands for that, start putting some weight in the stirrup. Then lift yourself straight up, with your full weight in the stirrup. Your horse should stand still for each step. Don't rush the steps—be sure the horse is 100% obedient before moving on. Finally, you should be able to sit in the saddle. Be sure if your horse seems inclined to move once you're on, that you gently check his forward motion. It's really easy to get into the habit of letting your horse walk off before you are truly organized in the saddle. If your horse moves off as soon as your backside is in the saddle, you'll be re-enforcing a bad habit. Be sure you ask your horse to halt and stand quietly while you settle yourself and prepare to ride. Be sure to do this each and every time your ride as it's very easy for both of you to slip back into the habit. What is the Method for Teaching Your Horse to Neck Rein?